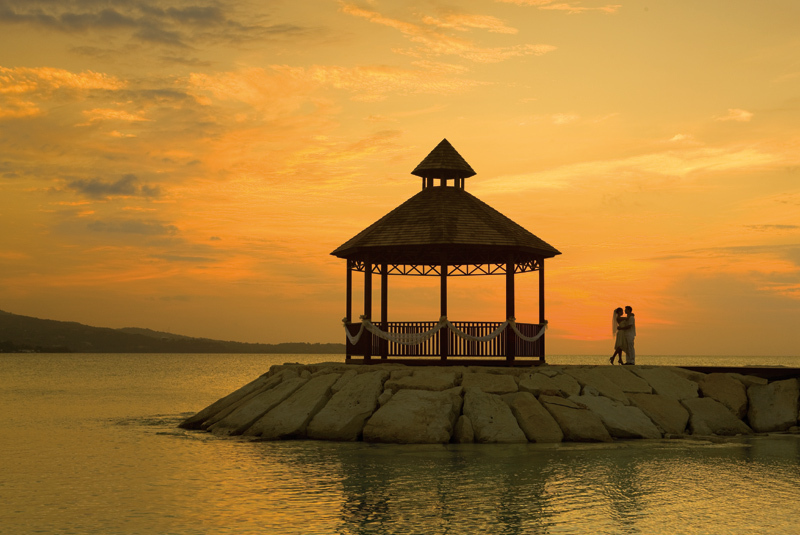 For sun-soaked ceremonies and luxurious honeymoons, the Caribbean is an easy choice. But choosing a single resort venue, from the wide range of options isn’t so simple. So we’ve rounded up our best all-inclusive wedding resorts in the Caribbean, where you can find your perfect match! Head to the secluded Punta Cana paradise of Excellence El Carmen and you’ll find a world-class spa offering packages designed especially for the bride-to-be and her wedding party, a contemporary twist on tropical architecture, and a stunning golden-sand beach just waiting for wedding-album-worthy photos. Planning your celebration is the perfect blend of ease and personalization, with a choice of three wedding packages and endless opportunities for custom touches. Choose the Excellence Wedding Package and receive a horse-drawn carraige transporting one member of the wedding party to the wedding gazebo, a complimentary bouquet and boutonniere per wedding couple, a wedding cake late checkout for the wedding couple and more. Splurge and pick the Gold Excellence Wedding Package, where you’ll enjoy amenities such as upgraded bouquets and boutonnieres for the wedding couple and their wedding party, a video of the ceremony, a private reception and a 50-minute couple’s massage. How luxurious! If you are dreaming of a multi-generational event where the kids have as much fun as the adults, this is the spot to host your Caribbean destination wedding. Get the whole group together for a little pre-wedding fun at the bowling lanes and then relax with your sweetie in your romantic in-room Jacuzzi. 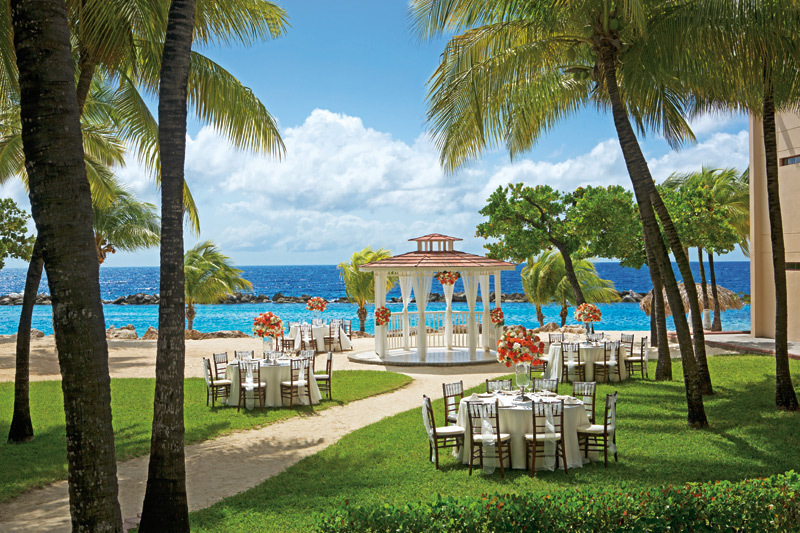 For the Big Day, choose from ocean-front or poolside settings, or exchange your vows in the resort’s lush gardens. Pick your perfect wedding package and enjoy perks like discounts on spa services, a romantic honeymoon dinner for two, late check-out for the newlyweds and more! For the total lavish destination wedding package, choose the Ocean Paradise package where you’ll indulge in perks such as hair styling and makeup for one person of the wedding couple, a cocktail hour with hors d’oeuvres, open bar service, and a live Dominican music trio. Don’t forget to head the spa for a 10% discount! Your love proves that two is better than one. 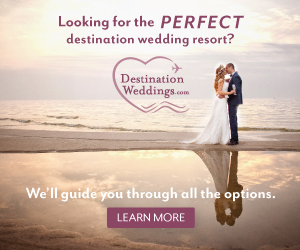 So why choose just one wedding resort? At this spectacular property, guests can also indulge at the adjoining Grand Palladium Jamaica Resort & Spa for twice the restaurants, bars and fun in the sun. 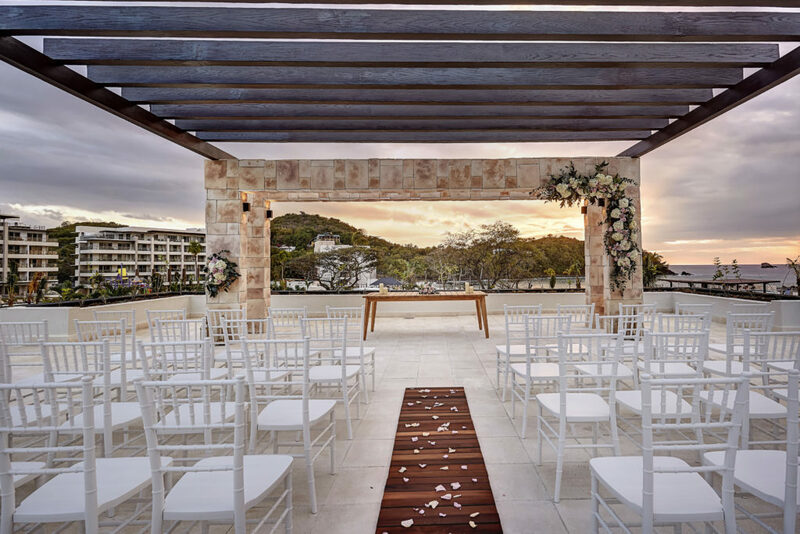 Opt for a ceremony with sweeping views at the cliff-top gazebo, or let the warm breeze embrace you on the breathtaking beach! Choose the Love Birds wedding package and receive one bouquet and a matching boutonniere, sparkling wine toast after the ceremony, a dinner reservation at one of the fabulous a la carte restaurants and nightly turn down service. Looking for a huge party on the night of your wedding? Pick the Bliss in Bloom Wedding Package for you and 20 guests to celebrate your love! You’ll be treated to VIP check-in, a bouquet of roses with a matching boutonniere, a dinner reception, a couple’s massage and a late check-out. After your ceremony, ring in your married life with your closest friends and family by dining at one of Grand Palladium Lady Hamilton’s delicious restaurants! Choose between Mexican, Italian, Asian, barbeque and local Jamaican cuisine for your nightly meal. Breakfast in bed the next morning will only enhance your experience as you leave your destination wedding fully relaxed and in love. Caribbean casual meets upscale sophistication at this five-star resort. An included kid’s program lets you expand your wedding list to include the whole family. For honeymooners and adult-only destination weddings, the exclusive Elegance Club adults-only area features 315 suites, private pool and secluded beaches that are perfect for post-wedding bliss. 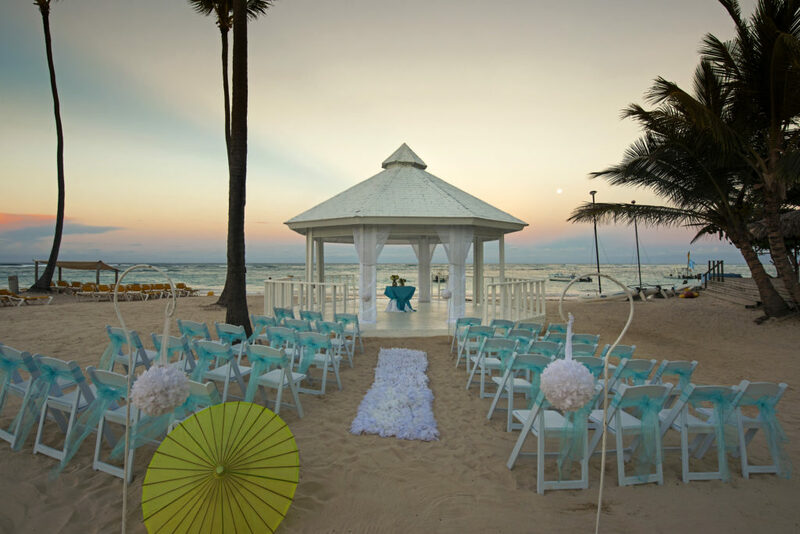 Weddings at Majestic Elegance Punta Cana come free when you book 15 or more rooms for seven nights or longer – so invite as many people as you’d like! Your ceremony will come with tropical flowers for your bouquet and/or boutonniere, a room upgrade for the wedding couple, early & late check-in/out, two bottles of champagne in your room and so much more. At Beaches Turks & Caicos, your Caribbean destination wedding thrives! Between the endless activities, luxurious accommodations and unbeatable service, you and your guests will have an unforgettable experience. 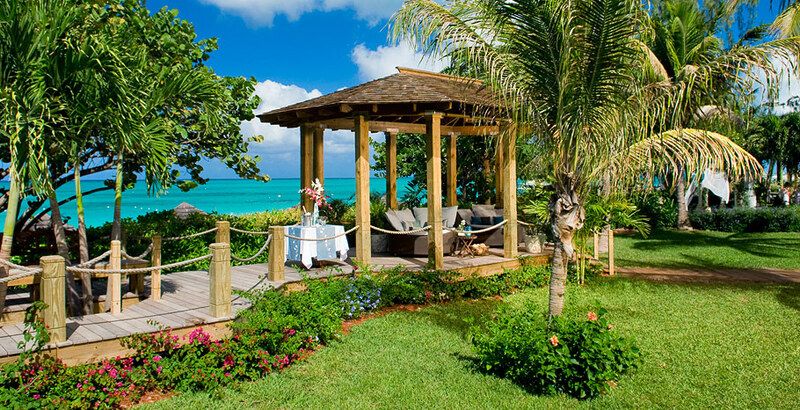 Weddings at Beaches Turks & Caicos have amazing personalized wedding packages to choose from. Every wedding package comes with a picturesque wedding location, a romantic honeymoon night turndown service for the wedding couple, and spa services for the wedding couple. Depending on your color palette of choice, you can base which wedding package is perfect for you. The Vision in White wedding package serves lace and eyelet details with white accents, while the whimsical Flutter of Romance gives pretty pink accents to everything from the menus, centerpieces, place cards and floras. If you’re looking for a tropical ceremony and reception, choose the Island Paradise wedding package and you will be surrounded by vibrant fuchsia, orange and yellow opulence. When it comes to Caribbean wedding hot spots, Curacao is often overlooked in favor of better-known islands. The Dutch island blends an old-world European feel with a distinctly tropical vibe. 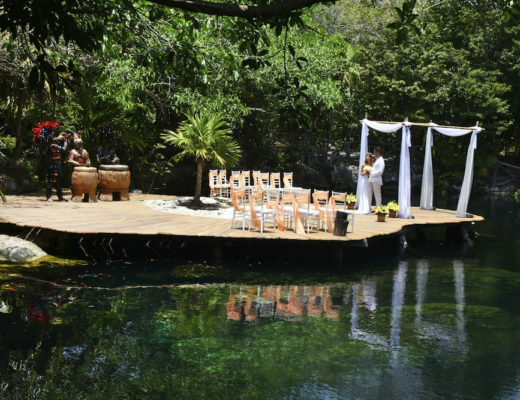 And, since Curacao is missed by tourists, you’ll have an intimate destination wedding like no other! A destination wedding at Sunscape Curacao Resort & Spa comes complete with everything you’ll need. Choose the Sunscape Sun Kissed Wedding Package and indulge in perks like wedding cake and sparkling wine for your guests, breakfast in bed with mimosas, late check-out and a 15% on all spa treatments. Turn up the romance with the Sunscape Forever Wedding Package, and you’ll be treated with boutonnieres & floral centerpieces, complimentary bouquets, special turn down service at night, a private cocktail hour with hors d’oeuvres and a dinner reception, and a live music trio to play during your ceremony. Nestled in the beautiful Caribbean island of St. Lucia, Royalton Saint Lucia Resort & Spa wraps guests in limitless luxury, from swim-up rooms to teen hangouts and adults-only sanctuaries, this is the stuff destination wedding dreams are made of. 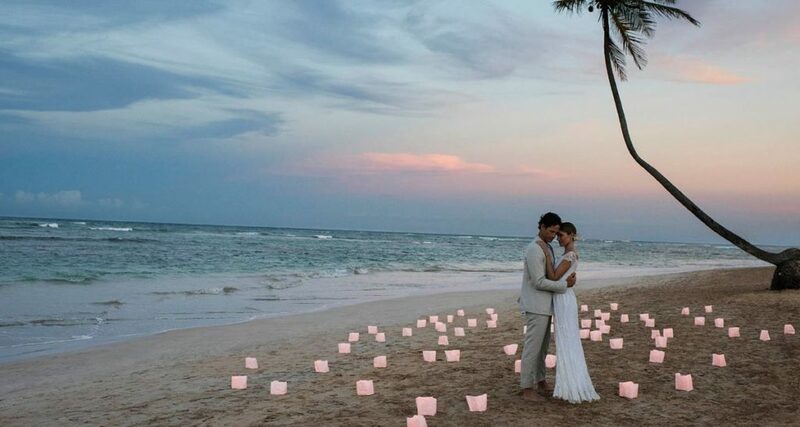 When it comes to planning a destination wedding in the Caribbean, Royalton makes the spectacular easy to achieve. Choose from a wide range of wedding packages, including toes-in-the-sand elopements for just the two of you and Sky Terrace ceremonies in an elegant gazebo towering over the resort for unbelievable views. Enjoy discount spa services, incredible gourmet cuisine and a once-in-a-lifetime experience of getting married in St. Lucia! Combining European opulence with Jamaican rhythms, Iberostar Grand Hotel Rose Hall is easily one of the best all-inclusive wedding resorts out there. This adults-only oasis offers world-class restaurants, a lush spa and plenty of Caribbean charm at every turn. Planning a destination wedding in the Caribbean has never been easier, thanks to several pre-designed wedding packages and a wealth of a la carte options (including cocktail hours and pre-ceremony massages!). 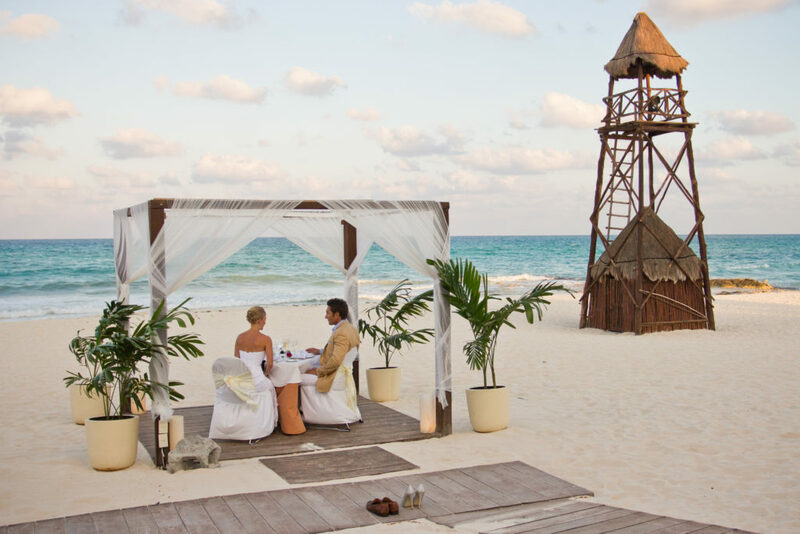 Your destination wedding will be held on a beach, in the lush garden or in a gazebo. You can even schedule a night-time ceremony, where twinkling stars and crashing waves add a hint of magic to the celebration. 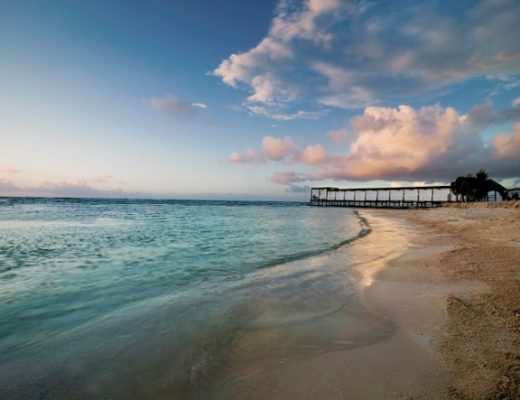 Montego Bay, Jamaica might be one of the Caribbean’s most-loved destinations, and Secrets Wild Orchid contributes to this vibe. 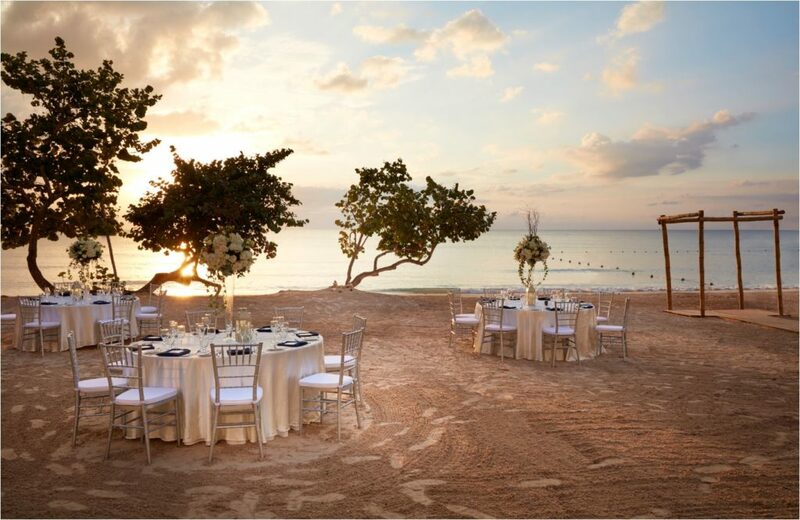 With over a mile of private beach on its own peninsula, an intimate beach wedding in Jamaica has never sounded more romantic! The Unlimited-Luxury® program allows you and your guests to be treated to top-shelf drinks, 24-hour room service and a host of activities day and night. Wedding packages range from the elegant simplicity of the value-priced Wedding in Paradise package, to the glamour of the Secrets Ultimate package complete with a cocktail hour, private reception dinner and live music. Located on the world-famous Seven Mile Beach in Negril, this five-star resort will pamper your guests during the days leading up to your destination wedding and those thereafter. Distinct enclaves within the resort bring families together for multigenerational fun and allow couples to bask in luxury in the adults-only section. 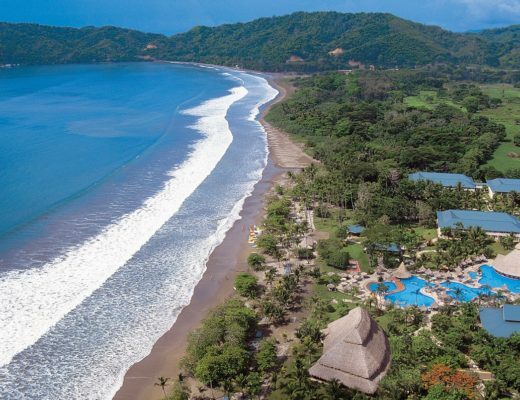 Here, you’ll find private adult pools, accommodations and gourtmet restaurants. A perfect place for a honeymoon! 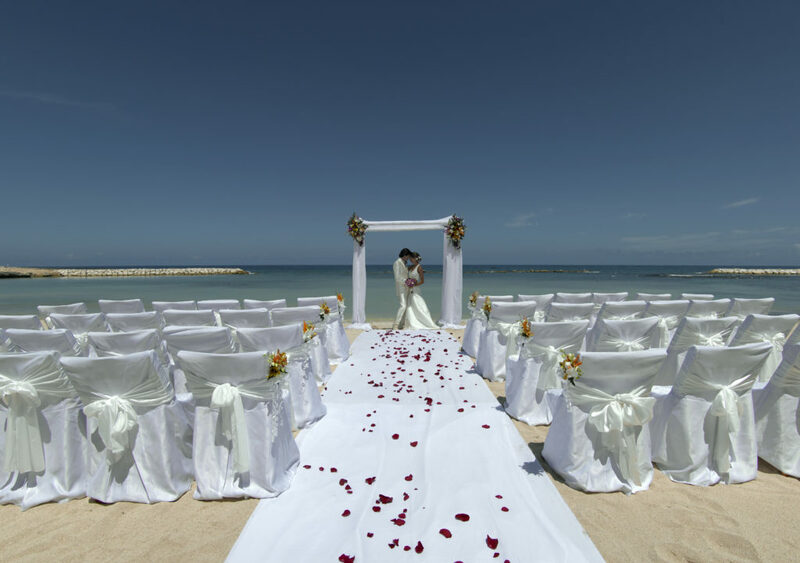 At Azul Beach Resort Negril, you have the option to customize any wedding package you want! Choose wedding packages designed around vintage, coastal, sophisticated, majestic and glamorous or colonial styles. Treat yourself to perks like a complimentary cake and flowers designed the way you prefer, endless ways to personalize your decor and ceremony, and a bridal spa suite on the day of the ceremony. It’s your day, so you celebrate in your own way! 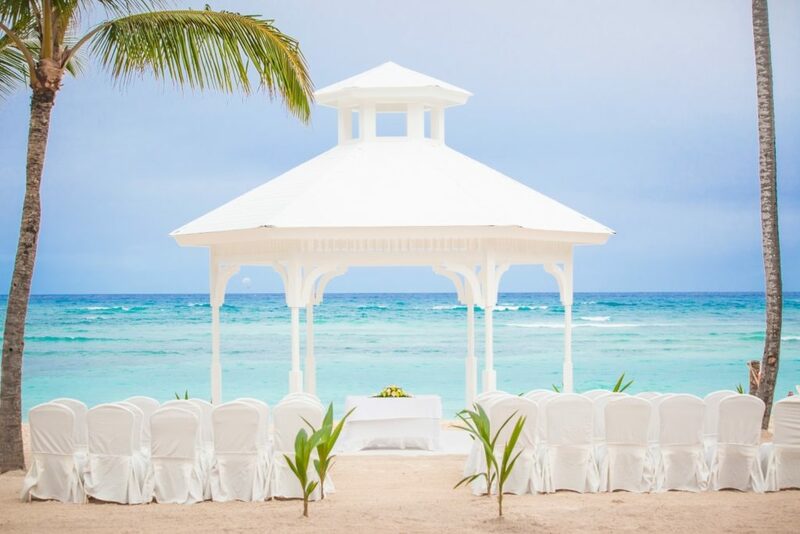 Whether you’re getting married on the beach or in a lush garden, all-inclusive wedding resorts in the Caribbean offer plenty of opportunity for making long-lasting memories. And with endless options of customization, you can make sure your Big Day reflects exactly who you and your partner are!